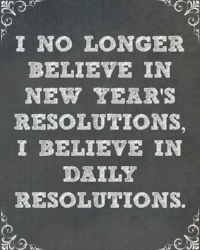 Are you one of those people who sets New Year Resolutions? Or are you someone who knows yourself well enough to avoid making such a preposterous 365 day promise? Maybe you prefer bite-size goals so you set 30 day goals or three month goals. I have been both but, this year, I’m saying to hell with it. No New Year Resolutions for me. Bye, Felicia! This year is going to be about daily intentions and habits that will lead to a better year and, of course, a better life. If there’s one thing I learned in 2017 it was to basically stop everything I had been doing: stop seeking, stop dieting, stop punishing myself, stop the negative self-talk and stop planning for things beyond my control. This was not an easy task for a stubborn control freak like me. When I thought I had stopped those things, I stopped myself again and stopped some more. Because of those 2017 lessons, this new year is about being present. Mindful. Grateful. Peaceful. And while I have a few small goals in mind, like paying down more of my student loan, I am not committing to anything that will stress me out. All of my intentions revolve around cultivating peace and presence. My 2018 is about daily mindfulness and habits that will ultimately lead to a better life. For instance, a daily gratitude practice and eating healthy are important to me. But I'm keeping it relaxed so it doesn't become a chore or a bombardment to my days. Similarly, the undesirable self-care acts are on my radar as well. Saving money and budgeting with intention and mindfulness aren’t fun but will result in a better future for our family. My friends reading this are probably floored. I am usually the girl with 14 resolutions that have failed by April. I’m starting one workout while thinking about the next. I’m weighing what diet will be most effective for losing 20lbs. I'm also the one with the stack of bedside books on the self-help/personal development; the one constantly trying to change, grow and be better than I was the day before. I always feel crappy so I am the friend who’s trying on a new diet as often as I buy shampoo. I’ve tried paleo and keto and Whole30 and gluten-free AND dairy-free. I still feel crappy, despite all the restrictions, so I’m done! No more dieting! This year is about tuning in and listening to my body. After my recurrent miscarriages (four in three years) I disconnected from my body. I subconsciously shut off that link because of the grief, guilt, shame, resentment and anger. Now, I am rebuilding that relationship by getting quiet with myself, listening inwardly and fulfilling my needs. If I crave chocolate, I’ll have a piece and enjoy - nay! - savour every single nibble. Lately, my body wants peanuts. A few months ago it was steamed broccoli. If we stop dieting and just listen, I truly believe our bodies will tell us what it needs and very rarely will it say a Big Mac with supersized fries and a fountain Coke. But, if it does occasionally, go for it with zero regrets! Move your body because it’s a beautiful vessel capable of running, jumping and floating. I am called to swimming and yoga lately and it feels so much better to exercise because I like to than to do a cardio workout because it’s a part of my scheduled fitness program. I’m done body shaming and judging my body in the mirror. In fact, I’ve come to appreciate and love my body. I no longer feel shame for what it cannot do or what it looks like. I am grateful for my perfect working limbs and my curves, muscle, cellulite! All of it! Most of all, I am loving the woman who stares back at me. I’ve worked hard through reading, self-reflection, journalling, counselling, learning and so much more to become the person I am falling in love with today. I see a woman who is kind, thoughtful, funny and resilient. She’s also stubborn, short-tempered and a little self-righteous at times. She loves yoga and running and dislikes broken promises and flaky people. She is finally confident in her skin now. I’ve read so many incredible books that have helped lead me to this point. Fall and winter 2017 were spent reading books that actually intrigued me and interested me rather than reading to change something about myself. Oddly enough (or, perhaps, not oddly if you are a Universe energy-loving type like myself), the few books I picked have actually been life changing. I feel so liberated and amazing, gliding into 2018 with small pieces of inner peace, an abundance of gratitude and a mantra to be present and mindful. I feel lighter now that I’m not weighed down by unobtainable goals, self-loathing and a diet. I feel freer not being attached to a fitness regime. I feel happy not having any New Year Resolutions. 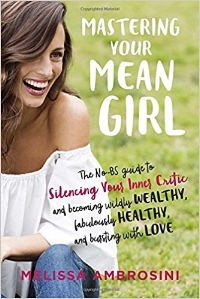 Every woman who has ever thought she was fat, been on diets, counted calories, or loathed what she saw in the mirror NEEDS to read this book. Mel Wells teaches you to tune into your body, to really listen and to appreciate it for what it is at this exact moment. She shares her own personal story and struggles with an eating disorder and how she’s overcome it. Using testimonies and “fitspiration”, you’ll fall in love with your body a million times over and kick diets to the curb once and for all! Using logic and love, she teaches you how to change your thoughts and stop judging yourself. She helps you heal your body image. If you love your body you will ultimately want to treat it right, right? So instead of restricting calories and denying yourself delicious meals, focus on what makes your body feel good and then do more of that! Just thinking about this book gives me goosebumps. Since reading this book in early November my life has actually changed. Or rather, my perception has changed so, therefore, my life has changed. Grout shows you how incredible it is to be a living, thinking, miraculous human and how each day is a perfect day to be overwhelmingly grateful to be alive. She gives you tools (which she calls Party Games) to find the gratitude in EVERYTHING. She gives thanks for everything and everyone. Since I started doing the same, I’ve seen an increase in my skin care company, requests to do workshops, more visitors to my blog, an appreciation for everything, and a bubble of happiness that sits in the centre of my chest, waiting to bubble over and out, omitting love and laughter everywhere. Sounds cheesy, I know, but wow, her words are incredibly powerful and waking up to the divine existence in ourselves is even more powerful. She encourages you to wake up every morning and, before even getting out of bed, proclaim something awesomely amazing is going to happen that day. It’s a beautiful habit to adopt. It's actually one that my best friend and I are doing. We text each other every morning and share three things we're grateful for. It sets a good tone and vibration to start our days. An attitude of gratitude, for the good and the bad, is truly magical! This is a book that will blow your mind. Moorjani, a woman riddled with cancer, falls into a coma and has an incredible near-death experience that actually heals the cancer that is killing her. Not only is her story a medical miracle and completely unbelievable, yet awe-inspring, but the wisdom and love she finds on the other side of the veil is poetic, romantic and beautiful. One thought she shares that sticks with me is: what if Heaven is Earth? We all strive for a Heaven above but, up there, you can’t taste chocolate or feel a hug. Maybe Heaven is here and we’re meant to be expressions of heavenly love. Isn’t that wonderful? Her words also give me great comfort in dying. I can honestly say (being a healthy woman so hey, this could easily change in the face of death) that I’m not afraid to die. She actually brought me peace with this inevitable fact. Death may not be as bad as I thought it was. It’s not religious but it’s deeply spiritual and life-affirming. Love, she says, is the answer. Always. I hope you enjoy these incredible books and they make impactful impressions upon you like they did for me! Please let me know if you've read any of the above OR if you have any further recommendations to add! Which magical books are on your nightstand this January?